Indisputably, the most important news from the Nov 27 school committee public hearing was the overwhelming public push back from teachers, students, alumni, community members, mayor, school committee and other elected leaders strongly refuting unproven claims of an anti-Semitic bias in Newton school curriculum. But there was also a side drama from Newton Republican City Committee Chair Tom Mountain. 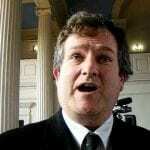 Newton Republicans…why do you still let Tom Mountain represent you? Mountain is chair of the Newton Republican City Committee. 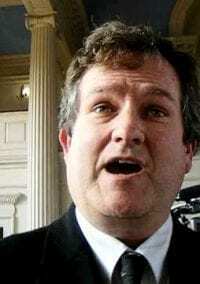 He was in the news again this weekend for calling the police when a group of dozens of Jewish protesters stood in a circle outside of the state headquarters of the Massachusetts Republican Party in Boston. 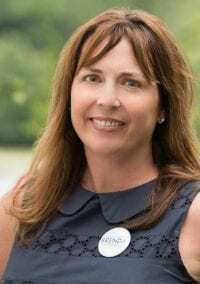 Newton City Councilor Brenda Noel had a must-read column in this week’s TAB this week written in the form of a letter to Newton Republican City Committee Chair and frequent TAB columnist Tom Mountain. Super Bowl politics: Does it feel different this year? News flash to all Democrats cheering on the Patriots for the Super Bowl, especially those husbands whose uber-feminist wives still let them watch this violent sport: Bob Kraft, Bill Belichick and Tom Brady are all friends and supporters of President Trump. So as you’re cheering on Tom know that after the game he’ll return to his Chestnut Hill estate to gallivant about in his red “Make America Great Again” hat. That is, unless he and Bill opt to hang out with their pal Donald Trump first. Here I am, in Patriot Nation, hoping that the Pats will flaunt another Super Bowl win in NFL Commissioner Roger Goodell’s face, but the league’s indifference to the health of its players is infuriating me. How can I support a business that’s uncompromising in its policies about pain relief while its employees develop devastating addictions? Does the Trump/Brady/Belichick/Kraft connection, Gail’s concerns or any other factor change how you feel about this Sunday’s game? I don’t usually take Tom Mountain too seriously but, perhaps given our overall political climate, his latest TAB column got under my skin. Should there be term limits for Newton’s mayor and city council? “The Argument” in yesterday’s Globe West featured City Councilor Ted Hess-Mahan and Republican City Committee chair Tom Mountain debating the whether or not the Newton Charter Commission should impose term limits on mayor and city council.